Finding Smile: A litany of “Fifth Beatles” may continue to spark debate among fans, but when it comes to the Beach Boys, a handful of external collaborators ought to garner similar recognition. Darian Sahanaja is among them. Sahanaja’s detailed work was first used as a roadmap for live Smile performances and, ultimately, the re-recorded Grammy-winning version, Brian Wilson Presents Smile, in 2004. Now it is the official template for The Smile Sessions, a new, lushly expansive collection devoted to the original sessions of the Beach Boys’ abandoned masterpiece and the most famous unreleased album of all time, due out Nov. 1 in both deluxe box set and 2-CD packages. As a current member of Wilson’s band and a consultant to Capitol for The Smile Sessions, Sahanaja opened up about all things Smile in the weeks leading up to this highly anticipated release. 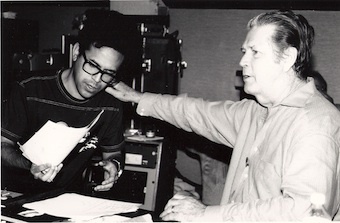 Aquarium Drunkard: Given that the track list for Capitol’s release of The Smile Sessions is based heavily on the work you and Brian Wilson did together for Brian Wilson Presents Smile, it seems you have played and continue to play a tremendous role in the legacy of the Beach Boys. What are your thoughts on your role in the group’s legacy and history? Darian Sahanaja: It’s interesting because here we are, eight years later and I still feel very fortunate that I was in the right place at the right time. I mean, at the end of the day it was always Brian and Van Dyke Parks’ creation, and I merely facilitated their ideas. That being said, of course, I feel extremely flattered when people show such deep gratitude. Some have suggested that along with being in the right place at the right time, that I was perhaps the right person. Looking back, I’m at a point where I can accept that. AD: I’m always curious to ask insiders to pick favorites. What is your favorite piece of Smile music? Darian Sahanaja: I remember around 1984 or ’85 getting one of the first cassettes with Smile bootlegs floating around and hearing this version of “Wonderful” with Brian playing harpsichord. That pretty much changed my life. It sounded to me like the natural link between Pet Sounds and “Heroes & Villains.” So amazing. Even now, when I think of Smile I think of that piece. AD: Do you know of any newly discovered session tapes or recordings that The Smile Sessions were able to utilize that you and Brian did not have access to when writing and recording BWPS? Darian Sahanaja: No. Nothing major. Perhaps a few variations here and there, but nothing that would have altered the making of Brian Wilson Presents Smile. I think back in the ‘60s some tapes were pilfered, and it was also sort of standard practice for tapes to be recorded over. So if you think you’re not going to use a take, just record over it. I know that Capitol exhausted every nook and cranny hoping to find any revelations. They put out feelers to anyone and everyone who may have had tapes or acetates and with the exception of a few novelties, nothing of any great musical weight surfaced. AD: What about this previously undisclosed version of “Surf’s Up” from the Wild Honey sessions that took place later in 1967 after Smile had been shelved? Darian Sahanaja: The “Surf’s Up” ’67 track is the track that blew me way. It is probably the most beautiful version I’ve ever heard. Brian is at his vocal peak, but with that laid back soulful thing he had going on at the time. It was a period where he and Carl [Wilson] almost sound identical. It is just spine-tingling great. Brian had just had his piano custom tuned to give it that Wild Honey sound and wanted to hear how it sounded in a recording. And so he sits down and performs “Surf’s Up” from start to finish. Nothing really new in structure or composition, but it is interesting to know that he was still enthusiastic enough to want to perform it even after Smile had pretty much been retired. AD: So what else can fans expect from The Smile Sessions? Darian Sahanaja: I’ve heard all of it, and it sounds amazing–better than anything else that has surfaced from the original Smile tapes. They were able to go back to the multi tracks where possible. It’s like restoring an old film print. When you do that, you’re going to reveal details that were not apparent before. The sound quality is the first thing fans should look forward to. AD: How were you involved with The Smile Sessions? Darian Sahanaja: [The Smile Session co-producer] Alan Boyd brought me in to bounce ideas around. Basically, there was a discussion about whether to follow the 2004 sequence or completely present something new. In the end, of course, it all has to be approved by the Beach Boys themselves, and Brian lobbied hard for The Smile Sessions to follow the template of Brian Wilson Presents Smile. Because the original record was never finished and we’ll never know exactly how it would have been completed in the 1960s, the thing I was most pleased with is that this release is not being presented as the definitive Smile, which would have been misleading, but instead as The Smile Sessions. That decision put me much more at ease about the whole project. I’m happy about it. AD: Brian Wilson Presents Smile included “I’m in Great Shape” much later in the running order than The Smile Sessions does. Any thoughts on its placement or why that may be? Darian Sahanaja: When we first started the project in 2003, the main objective was to find a sequence that worked best as a live performance. We were looking to find a nice way of sewing the music together so that it flowed in a concert setting. Starting the third movement with “I’m In Great Shape” was probably a performance decision. I always felt that this song building into a feedback frenzy and breaking into “I Wanna Be Around” and “Workshop” was the disoriented, reality defying portion of the performance. Shaking things up and slightly derailing before getting back on track–as if a metaphor for life. It seemed to fit for those reasons. 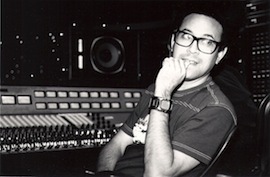 However, the tape session research shows that it was definitely part of the “Heroes and Villains” variations, and so the decision [with The Smile Sessions] was to keep it within that context. AD: When working with Brian on BWPS, what specific parts of the album were informed by memories and ideas that were unrealized during the original 1960s sessions, and what parts were newly written to connect with unfinished pieces already conceptualized? Darian Sahanaja: There were a few moments when I felt that Brian was clearly tapping back into a previously rendered idea. For example, when he grabbed the lyric sheet out of my hands and started to sing the melody for what was to become “Roll Plymouth Rock.” It was so immediate that I couldn’t help but feel that it was always there. But Brian doesn’t necessarily verbalize his intentions. He never comes off as calculating, and so it did blur that line between old and new. Van Dyke, handling things on the lyrical end, seemed more in tune with the conceptual flow and imagery. That’s how things like “rock, rock, roll” from “On A Holiday” were incorporated. AD: In general, did Brian clarify his ideas as “This was the original idea,” vs. “This is how I now think we should do it,” or where all the ideas just mixed in with each other with no indication if the idea was old or new? Darian Sahanaja: Whether they were original 1960’s ideas or not, whatever felt natural to completing the big picture was the priority. Brian and Van Dyke were on a creative roll. AD: Did Brian discuss his original concept for “The Elements?” This is one of the most hotly debated topics among Smile fans and even the release of the track list for the box set hasn’t really given a clear indication of what Brian’s intentions with this part of the album were. Darian Sahanaja: Brian never ever referred to any of the pieces as being part of some Elemental concept, and whenever I did bring up the concept he didn’t seem to react to it with any enthusiasm. I brought it up again while Van Dyke was around and didn’t get a clear reaction from him either. My gut feeling is that it was one of many subplots and underlying themes being tossed around back in the day. It does however tie in nicely with the concepts of western expansion, manifest destiny, birth and rebirth, and so I’m sure they would respect a listener’s interpretation. AD: Was a “three suite” structure Brian’s plan for Smile from the get-go, but the vinyl format made that difficult, so it was easier to accomplish on CD so many years later? Darian Sahanaja: I honestly don’t know the answer to this. Neither Brian or Van Dyke have ever talked about it. AD: Did you and Brian work on any Smile-related music in 2003 that did not make the final track list for BWPS? AD: With so many sections and versions of the song, how long did it take to finalize a concept and recording for “Heroes & Villains” for BWPS? Darian Sahanaja: Not too long. We had already been performing a version of the song that incorporated the “Cantina” section, and so Brian wanted to go with that structure for the recording. It was more about how we were going to get in and out of it. This is where having all the pieces easily accessible on my laptop was extremely helpful. Modular assembly. AD: What one thing struck you the most about working in the studio with Brian? Darian Sahanaja: It wasn’t so much about working with Brian, but watching the dynamic between Brian and Van Dyke. It was so fascinating to see two people who, on the surface were so different, work so well together on a creative level. It became so obvious to me why they were drawn to each other back in the day. They kind of got off on each other’s energy. So in a way they weren’t that much different from one another at all. That blew me away. AD: Why do you think Smile, in its released and unreleased forms, has and continues to hold the fascination of so many fans the world over? Darian Sahanaja: Good question and one I ask myself often. There’s something about an unfinished work of art produced at the height of the artist’s most creative period that spans an entire spectrum of opinion. It allows people to project their own “what if” scenario–a launch pad of dreams. Everyone gets to fill in the gaps and imagine their own perfect version. It’s the ideal musical fantasy. Of course it helps when the music is excellent. The Smile era music also shines because of musical context. In the same way “Wouldn’t It Be Nice” was an advancement of “California Girls,” you could hear a further evolution with “Surf’s Up.” Brian was really pushing his creative envelope during this period. But he didn’t just sacrifice craftsmanship for the sake of art like so many others did. His was a nice balance. By comparison, you can truly appreciate Picasso’s cubism period when you see the natural evolution from his pervious works where he clearly had mastered painting realism. And we shouldn’t forget its context in the pop culture timeline. By 1966, there were only a handful of young composers that were truly pointing the way for a generation. With the youth movement gaining momentum, the music that spoke for them had to evoke freedom. The Smile music was and still is liberating on many levels, and because of that it continues to inspire creative hearts and minds. Timeless stuff indeed. One question I’ve always had since the first Smile recordings came out, is how Brian & van Dyke collaborated. Thanks for sharing a bit of light on this. Still, the story is: Brian wrote the music, Van Dyke the lyrics. However, as Van Dyke is a professional musician with lots of knowledge about American music history in the first place, I still wonder how he has influenced the actual composing process, and/or use of certain instruments in the arrangements. Great interview. Darian Sahanaja always seemed like a really intresting guy and I never got to read an interview with him before. I have Brian Wilson Presents Smile DVD and really enjoy the segments with Sahanaja working with both Brian and the other musicians. Really looking forward to this release and with it coming out the Tuesday following the WFMU Record Fair in NYC it looks like it may be an expensive couple of days. Thank You! for your keen insight. Its a truly wonderful, coherent and non fan magazine type interview!!! The gratitude Darian talks about finally accepting has been earned in many ways (including some we’re not privy to). I don’t see how this boxed set – or Brian’s return to public performing – could have happened without Darian. Anyone who values Brian’s music – and his well-being – owes Darian more than we may ever know. And if you haven’t checked out “Tracey Hide” (Wondermints) yet, you’re in for a real treat….it’s almost like hearing a SMiLE outtake, and more evidence of what Brian heard/saw in Darian from the outset. I think Darian’s knowledge, collection of Smile parts, musicianship, and his own personality, were all necessary to get the program going, and finished – an accident of history. The opening Smile concert in London will go down as one of the great moments in pop music.